Our Old Forge development is one of our developments that is split. The site is situated in two different areas of Old Forge. The elderly portion of the site is on Apollo, and Eisenhower Drives. 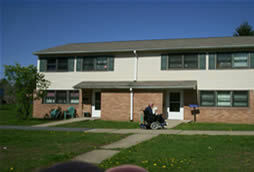 The family units are located on Dunn, George, and Kohler Avenues. The elderly site is at the most southern tip of Old Forge while the family units are located at the more northern end. This site is one of our largest it has a total of 124 units. Both sites are off a Main Avenue and have access to both public transportation and also there are some retail stores within walking distance. This development is in the Old Forge school district. Recently there have been improvements to this site as far as the facade of the buildings, lighting and roofs.